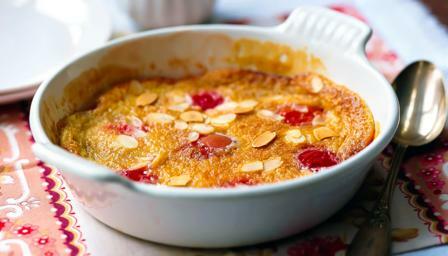 Halved plums are covered in a light batter and then baked in the oven to make this traditional French dessert. British plums are at their best in September, so make the most of them then and try this simple pud. Pour the milk, cream and vanilla into a pan and boil for a minute. Remove from the heat and set aside to cool. Tip the eggs and sugar into a bowl and beat together until light and fluffy. Fold the flour into the mixture, a little at a time. Pour the cooled milk and cream onto the egg and sugar mixture, whisking lightly. Set aside. Place a little butter into an ovenproof dish and heat in the oven until foaming. Add the plums and brown sugar and bake for 5 minutes, then pour the batter into the dish and scatter with flaked almonds, if using. Cook in the oven for about 30 minutes, until golden-brown and set but still light and soft inside. Dust with icing sugar and serve immediately with cream.